The initial focus on making use of the unused space between Coca-Cola bottles meant that the packaging was going to receive particular attention. It was never going to be a straight forward cardboard box. What’s been particularly interesting and rewarding is to see the way the package – the AidPod – has become much more than a container to carry the components of the Anti-Diarrhoea Kit (ADK) or the ‘Kit Yamoyo’ as we are now calling it. For the newly named Kit Yamoyo, the package has become a part of the kit itself – acting as a measure for the ORS, a mixing and storage device for the ORS solution, and potentially a device to sterilize the water used, through the SODIS technique (although we still need to test this). In the trial, we will be testing – amongst other things – the hypothesis that if you create a demand for a commodity in remote rural communities and make it profitable to fulfill that demand then the commodity will get there. It our case the commodity is ‘Kit Yamoyo’. Demand creation takes marketing effort and time. For the trial, therefore, we will be ensuring demand through the distribution of vouchers to mothers and care-givers as part of the marketing effort. These vouchers will be exchanged for the kit, and retailers will redeem these vouchers on their mobile phone and be paid on their phone too. This process will give near real-time data on sales. The evidence we generate in the trial around the use of vouchers may lead to a different way of thinking, when agencies are faced with the need to get particular products to particular people in the future. 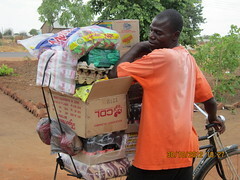 It may be possible to use vouchers to motivate and mobilise the private sector to supply public health products to people in need as an alternative to creating a parallel, public sector or donor-driven distribution system, which will not have the experience and motivations of the existing, proven private sector system. We will also be using mobile phones to provide an authentication service so that anyone along the distribution chain, and care-givers themselves, can check that their Kit Yamoyo is authentic. This is important in countries where there is often concern about counterfeit medicines. And finally, there is innovation in the commodity – the Kit Yamoyo – itself. 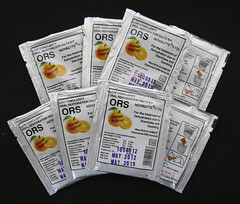 The most significant, we feel, is the creation of 4g/200ml ORS sachets rather than the ubiquitous 20g/1litre sachets. Traditionally, ORS comes in 1 litre sachets. Yet these were originally designed for institutional use and are, quite frankly, inappropriate for the home treatment of diarrhoea. A sick child at home will typically drink 400ml of ORS solution in a day. What isn’t consumed needs to be thrown away after 24 hours. This is wasteful. But more importantly, it encourages mothers and caregivers to ‘save’ their ORS powder, by sprinkling an unmeasured proportion of the 20g sachet into an indeterminate amount of water. 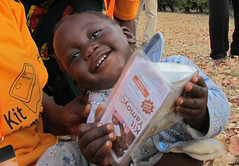 Most mothers/care-givers in rural areas will not, in any case, have a 1 litre measure, or know what 1 litre looks like. So, it is highly likely that they will make up a solution that is either too weak to be effective or too strong, so that it causes osmotic diarrhoea and makes things worse. This innovation – providing appropriately-sized 4g/200ml ORS sachets, inside a container which serves as a 200ml measure – is the one causing most excitement among the health professionals we work with. WOW! well done Simon and all the ColaLife team! Really exciting to see how your are moving forward – so much to learn! 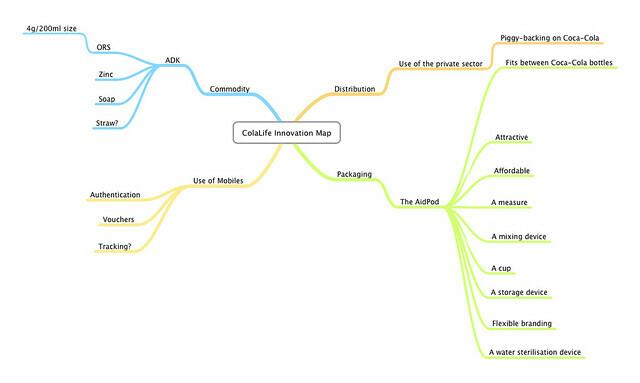 At some point will be great to write a book with a version of ColaLife from the Innovation and Design perspective for social innovation leadership. Thanks for your comment. The book is on the ‘To Do’ list!